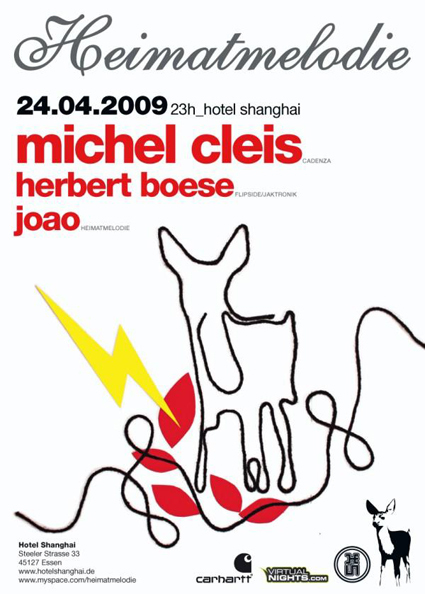 This friday the party serie Heimatmelodie invites Michel Cleis to play for the first time his spiritual percussive version of House in the rooms of the so called Shanghai. Currently the guy from Lausanne is one of the most critically acclaimed young dancemusic producers. After some releases on My Best Friend his first two E.P.s on Cadenza Records momentary played massive by DJ Stars like Luciano or Loco Dice. If you like to dance to House that plays with Ethno-Sounds and percussive tribal drums, this party is a perfect chance to dance the night away.